If your bathroom is stuck in a 1990’s ‘builders-grade’ time-warp we get it (and we see it daily looking at bathroom remodeling jobs also). A pitted bright brass 3’ x 3’ stand-up shower with flimsy doors. This shower feels like an old-fashioned phone booth. It stands next to a mega-sized drop-in Jacuzzi tub. This huge space-wasting dust collecting monster is never even used any more. The stained oak double-bowl vanity with raised paneled doors really looks dated. Sure, this bathroom WAS hot…. back in the day. You’ve concluded its time to reinvent this behind-the-times space. You’re not only looking for an updated bathroom design style which you’ll love using today, but one which will live well for many ‘tomorrows’ to come. What design style can that be? I would argue that bathroom design style is contemporary. 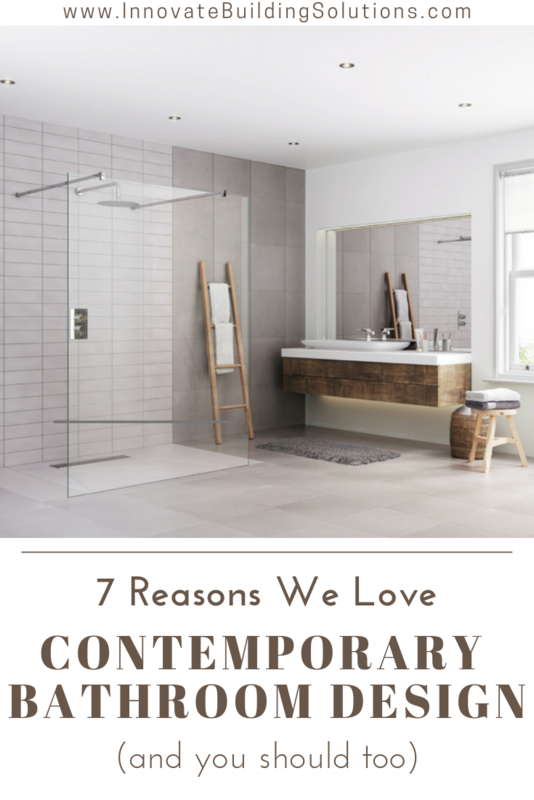 In this article I’ll look at 7 reasons I (and my team) love contemporary bathroom design (and why we believe you will too). You’ve looked at one too many issues of Architectural Digest to put up with your crappy, outdated 5’ x 8’ bathroom any more. You’ve asked yourself what the heck was the guy who built this home thinking when…. He slapped in a fiberglass tub/shower unit which yellowed, scratched and now looks awful. He installed a floor-based double bowl vanity which takes up half the room. He had a tile guy install teeny-tiny mosaic tiles with huge grout joints which are a pain to clean. He didn’t include a window. It now feels dark, dingy and closed-in. You dream of a sleek, uncluttered, simplified minimalist bathroom. You’re unsure, however, if you can make this style work in your tiny space. 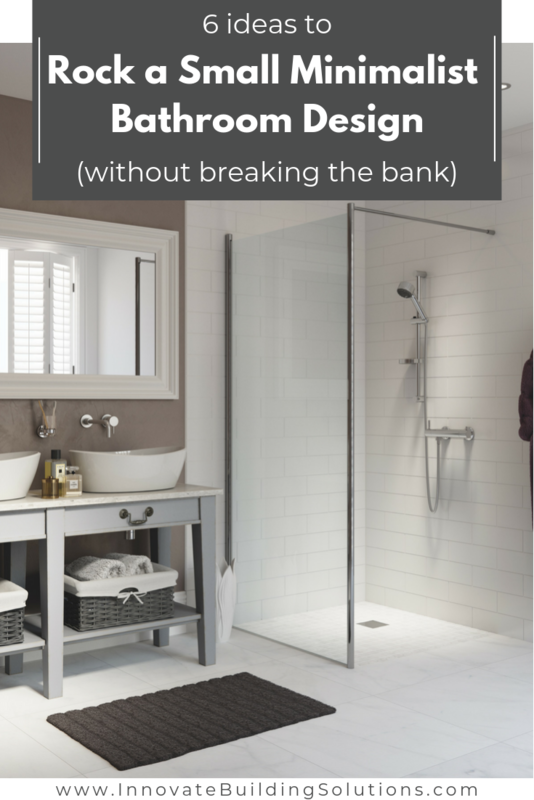 It’s simple to do anything with a big bathroom and a big budget, but how do you make a minimalist design work in a small space without tapping into your ‘Bill-Gates Trust Fund’ (oops, I forget Bill forgot to write you into his will…. yet). This article will show you 6 practical ideas to rock a design for a small minimalist bathroom without busting your budget. Let’s dig in. You thought designing your new bathroom was going to be simple until you dug into the details. Finally, you’ve figured out your shower pan, wall surrounds and glass enclosure. It was a journey…to say the least. Now, it’s time to choose a vanity. You thought, “How hard can it be to choose a vanity?” That was until you got into this next phase of the project. You know your current vanity has got to go. Your bathroom feels cluttered. It’s 5’ x 8’ footprint is overpowered by a 25” deep double bowl floor-based vanity you know (and don’t love) today. Yes – it’s nice to have 2 bowls and a deep countertop. However, squeezing around your spouse first thing in the morning can make a grouchy person, grouchier. After all you’re not trying to re-live the dance called ‘the bump’ from the 1970’s at 6:30 AM while you’re rushing to get ready for work. You’ve looked at pedestal and wall hung sinks. Since they give ZERO storage you know they aren’t right for you. After all, you desperately need space for lotions, potions, styling brushes and blow dryers. 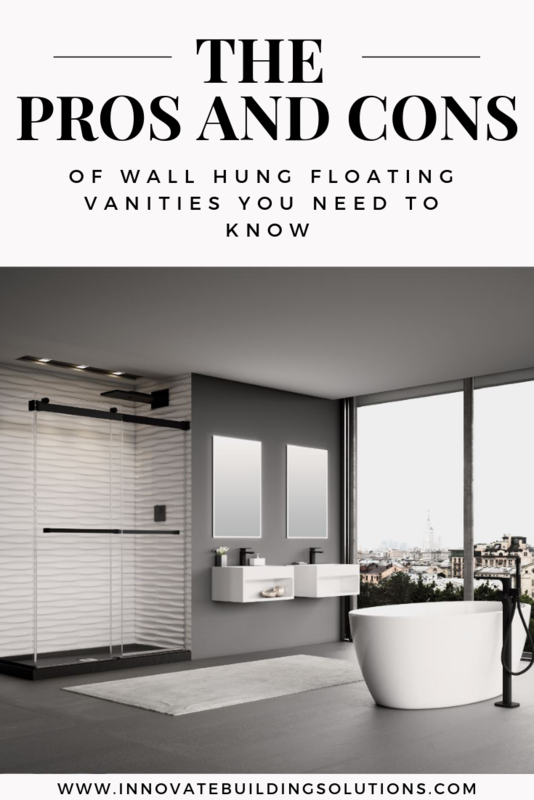 The idea of a wall hung floating vanity is intriguing, but you still don’t have your arms around the advantages and disadvantages of this option. This article is geared on helping you close your ‘knowledge gap’ to figure out if a floating vanity cabinet makes sense. While I wouldn’t recommend this style of cabinet for every bathroom, if you’d like a contemporary, simple to clean, and a not-too space consuming option, it may be perfect for you. Let’s dig deeper into the pros and cons of wall hung vanities.